Discover the latest news about Embrapa (Brazilian Agricultural Research Corporation, Ministry of Agriculture, Livestock, and Food Supply) on “Embrapa News Agency”, available in English and Portuguese. 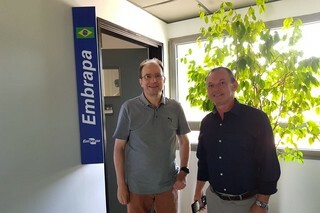 Netto, José Madeira da S.
Ana Brasileiro, a researcher at Embrapa in Brasilia, a member of Cirad Scientific Committee and of the International Consortium for Advanced Biology in Brazil (CIBA) has visited Pedro Machado, the coordinator of Embrapa Labex Europe in Montpellier. Labex Europe of Embrapa has received the visit of Nuno Ferrand, Director of the Research Centre in Biodiversity and Genetic Resources at the University of Porto (Portugal), accompanied by Albano Beja Pereira, a researcher. Since 2002, Agropolis International has been hosting the Brazilian LABEX and has been a facilitator for Embrapa and its local partners (CIRAD, INRA, IRD…). The LABEX Europe aims to post Senior scientists in ‘cutting-edge’ teams located in France and Europe where they work on the issues they have selected. These scientists work jointly with the hosting research teams while keeping up with the scientific and technological innovations in their field. The LABEX Europe is supported by the World Bank and the Inter-American Development Bank. Pedro Luiz Oliveira de Almeida Machado, EMBRAPA researcher (CV), has been appointed Coordinator of EMBRAPA Labex Europe as from January 2016. He succeeds Claudio José Reis de Carvalho. Collection "les dossiers d'Agropolis International- Spécial partenariat"
EMBRAPA (Empresa Brasileira de Pesquisa Agropecuária), the Brazilian Agricultural Research Corporation, linked to the ministry of Agriculture, Livestock and Food Supply, has the missions of 'providing technological solutions for sustainable agricultural development in Brazil to the benefit of the Brazilian society'. Founded in 1973, it has thus developed thousands of technologies of use in Brazilian agriculture, reduced production costs and helped Brazil to increase its food security while conserving natural resources and the environment. With more than 9500 employees including more than 2400 research scientists, Embrapa has built up a network of 42 research centers, 5 service centers and 15 central divisions. Present in all the Brazilian states, it additionally serves as a link between the institutions that are part of the national agricultural research system. 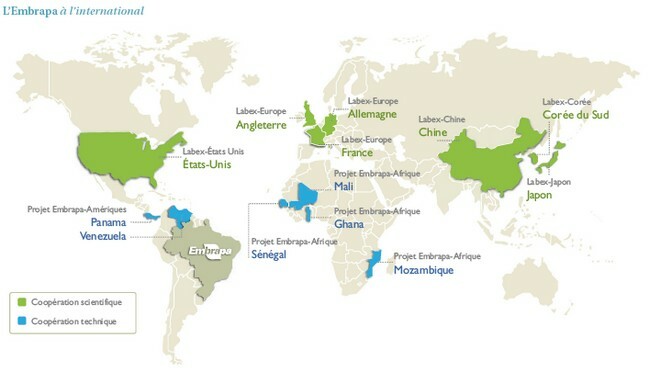 Embrapa is also involved in numerous international cooperation projects, in particular through the virtual laboratories abroad, 'Labex' (today in the United States, Europe and Asia), and thanks to technological transfer offices in Africa and Latin America. 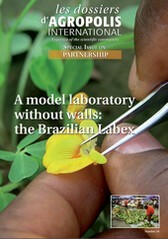 "From Brazil to Europe: 10 years of Labex Program, EMBRAPA's laboratory without walls"
"A model laboratory without walls: the Brazilian Labex"
Labex-Europe is now 10 years old, so it is time to learn from and share this unique international scientific cooperation experience. 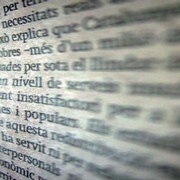 In the late 1990s, EMBRAPA explored a new partnership concept, i.e. the ‘laboratory without walls’ or ‘external laboratory (Labex)’, with Francisco Reifschneider, Eliseu Alves and Alberto Portugal being the main architects. Senior researchers are posted for 2-4 years in top-notch research laboratories abroad to foster exchange of their experience with other researchers. The ultimate aim is to generate new knowledge that will serve to develop innovative technologies for tropical agriculture. They join a high-level team and collaborate in a joint research project that will serve to create a research cluster through Brazilian and European scientific networks. These researchers must also devote a third of their time to exploratory activities (scientific monitoring, visits, participation in conferences, etc.) and to information activities geared towards coordination and supervision of the program. Four years after the first Labex was set up in the United States in 1998 (in collaboration with USDAARS*), a second one was launched in Europe. The French research centers CIRAD (Agricultural Research for Development), INRA(Institut National de la Recherche Agronomique) and IRD (Institut de Recherche pour le développement)mandated Agropolis International to sign an agreement between EMBRAPA and the regional multiinstitutional consortium (28 research and higher education establishments) hosted in the Agropolis International facilities in Montpellier, France. Labex-Europe was inaugurated in 2002. Labex has also set up offices in other regions of the world (South Korea in 2009, China in 2012). Issues were chosen by Embrapa, taking into account, on the one hand, common scientific priorities of Brazil and France and, on the other hand, critical mass of research in Brazil, allowing beneficial cooperation dynamics to both countries. Natural resource management tailored to and associated with knowledge-based technologies is a prerequisite for sustainable, efficient and intensive agriculture. This association provides a unique opportunity for development in harmony with environmental conservation. Agriculture thus becomes a solution–not a problem–when biodiversity and environmental conservation are taken into full account. Over the last 40 years, crop yields and agricultural area have increased by 4% (200% overall) and 30%, respectively, in Brazil. Agricultural technology development has reduced extensive agricultural land use. Indigenous land, biology reserves and naturalparks officially account for 60% of all land in Brazil. The Low-carbon Agriculture Program that has been under way for 2 years in Brazil has provided the necessary funding and incentives for farmers to adopt sustainable agricultural practices and technologies. The Brazilian agricultural research system, coordinated by EMBRAPA and including over 70 universities and agricultural research institutions, is developing sustainable agricultural intensification practices to boost productivity while generatin environmental services. New technologies and policies are being developed under this system to ensure that this Low-carbon Agriculture Program becomes an economic reality. Research has contributed to the development of other forest protection policies and impact reduction practices, leading to a reduction in deforestation in the Amazon region. Dr José Madeira, the first Labex scientist focusing on this theme, joined the research team of the Laboratory for the Study of Interactions between Soil, Agrosystems and Water Systems (INRA, IRD, Montpellier SupAgro) to study the hydrology of cultivated environments. His work involved modeling interactions between agricultural management practices and environmental indices through model development and validation and the development of vegetation indices for crops with a discontinuous canopy (vineyards, orchards, etc.). Image analysis data, obtained in collaboration with the Remote Sensing Center in Montpellier (France), were used in this research. The developed models describe water flows and the impact of management practices in microcatchments where intensive agricultural land use is under way. The Labex Program then hosted Dr Geraldo Stachetti Rodrigues in the Performance of Tree Crop-Based Systems research unit (CIRAD) to carry out an impact study and develop integrated system indicators for environmental management of rural activities. The used an integrated approach to assess palm oil according to international environmental certification standards and senso strictu sustainability criteria. 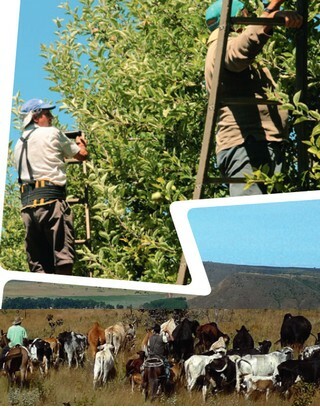 This research was aimed at developing indicators for tree crop-based systems: ecological integrity, economic vitality, social equity of rural production activities geared towards promoting local sustainable development. This work consolidated the partners’ scientific advance with respect to agricultural sustainability. Remote sensing and image analysis methods are now essential tools for agricultural and land-use monitoring. 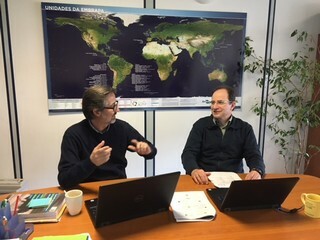 The Labex Program hosted Dr Margareth Simões to share expertise and methods with Territory, Environment, Remote Sensing and Spatial Information joint research unit (AgroParisTech, CIRAD, IRSTEA) in Montpellier and study land use and land cover dynamics assessment for a sustainable agriculture. The results will generate reliable tools to support public policymaking during the crucial transition from extensive agriculture to an ecologically intensive model. Brazil is a major global player for several staple food products and an exporter of manufactured food products. One of EMBRAPA’s priorities is thus to enhance the competitiveness of Brazilian agriculture via the added value of agricultural products while ensuring food security and safety. Agrifood technologies was an obvious choice as a Labex-Europe research theme because of EMBRAPA’s long-standing tradition of excellence with respect to food processing and security. 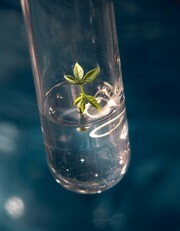 The first researcher, Dr Regina Lago, a fat and oil specialist, collaborated with the joint research unit Agropolymer Engineering and Emerging Technologies (CIRAD, UM2, INRA, Montpellier SupAgro), whose overall aim is to gain greater insight into the functionalities of plant products and their constituents so as to enhance their food and nonfood performances. The Brazilian castorbean plant, Ricinus communis, was selected due to its biofuel potential or as a source of vegetable oil of high quality and value for industrial chemistry. Then, Dr Heloisa Filgueiras, a postharvest physiology specialist, was the first Labex- Europe researcher posted outside of Montpellier. After a brief collaboration with Patrick Varoquaux (INRA), she worked at the University of Avignon and INRA on a joint interest project entitled the‘Effects of vegetable conservation pretreatments under modified atmospheric conditions’. A research partnership was established with the Laboratoire de Physiologie des Fruits et Légumes (UAPV), with Huguette Sallanon as scientific correspondent, to improve the quality of vegetable products ‘from farm to fork’ by developing the entire Fruit and Vegetable sector. There were two research focuses: studying the response of plants and their fruit to environmental conditions, and enhancing postharvest fresh fruit and vegetable conservation. The work spanned a broad range, from mangoes to endives, with the aim of studying possible alternatives to chemical conservation of minimally processed vegetables. The objective was to control metabolic processes in order to hamper enzymatic darkening and senescence while preserving the functional constituents. Lastly, two scientists took charge of the Agrifood Technologies theme in Dijon. Dr Rosires Deliza joined the team of the Centre des Sciences du Goût et de l’Alimentation (CNRS, INRA, University of Burgundy) which studies food behavior and its control. The proposed approach involved comparative sensorial physiology. Her work, carried out in collaboration with Dr Sylvie Issanchou, dealt mainly with assessing consumer reactions to new food products with improved nutritional qualities. Their work included participation in the TrueFood project*, partially sponsored by the European Commission, and the use of advanced experimental economics tools. 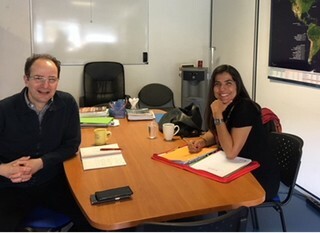 Concomitantly, Dr Amauri Rosenthal worked with the Laboratoire de Génie des Procédés Microbiologiques et Alimentaires (INRA, AgroSup Dijon) headed by Prof Patrick Gervais. The aim was to study the effects of high pressure and microwaves on bacterial spores, which represent a major challenge in food processing as outbreaks of these organisms could lead to a public health hazard. This research generated insight into the role of the spore water content on cell viability and spore inactivation mechanisms. World population growth, especially in poor countries, the continuous degradation of arable land, reduced access to drinking water and climate change are major challenges for agricultural production and food security. Plant improvement is a key approach to address the need to increase agricultural production while reducing the use of pesticides and fertilizers, thus enabling the development of sustainable agricultural practices. Rice is a staple food in Brazil. Many initiatives have focused on improving its tolerance to different abiotic stresses (drought, salinity, etc.). This trait is hard to improve in conventional genetic selection programs. Enhanced molecular insight into genes involved in the resistance/susceptibility to abiotic stress should facilitate the development of new varieties that are better adapted to environmental constraints. Diseases–leaf streak, Panama disease–threaten banana production in most growing regions. Their monitoring is costly and the pesticides used are toxic to humans and the environment. These threats also include banana bacterial wilt, Moko disease and banana weevils. Most bananas and plantains are susceptible to at least one disease or pest and no farmers currently grow improved banana or plantain varieties. Rothamsted Research (UK) is investigating virulence and pathogenicity mechanisms of Mycosphaerella graminicola, a pathogenic fungus of wheat of the same genus causing Black Sigatoka in banana, thus extending this first study. Brazil is still a net importer of wheat, so this is a priority crop for EMBRAPA. The research is geared towards understanding fungal virulence on wheat plants, by means of functional and comparative genomics, to better manage crops under warm temperate conditions in the South as well as tropical climate like in the central savannalike Cerrado regions of Brazil. In addition, high temperatures are conducive to wheat infestation by Magnaporthe oryzae in Brazil, which is related to Rice Blast, a major disease worldwide. Climate change scenarios forecast European summer to be warmer, posing a wide range of challenges to UK crops thus warranting collaborations between British and Brazilian scientists to develop international networks and enhance insight on this crop. This theme is now associated with the development of high throughput phenotyping procedures, which will be the first Labex theme to be studied in Germany from 2013. 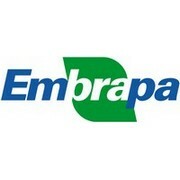 EMBRAPA is extending Labex-Europe by developing this theme in collaboration with the Julius Kühn Institute (JKI), Federal Research Centre for Cultivated Plants (Germany), in order to merge Brazilian tropical plant science expertise with the plant health and productivity expertise of JKI. This research will be aimed at developing noninvasive methods and processes (image analysis, NMR, sensors, etc.) to enhance plant breeding, assess the biological resource potential and identify biological traits and functions that could be applied in agriculture. Brazil is now the main scientific partner of the Montpellier agroenvironment cluster, in which one research unit in four is involved in an ongoing cooperation with one or more Brazilian research and training institution. In this setting, the Labex-Europe Program is an instrument to pave the way to new synergies for the scientific teams. The presence of experienced Brazilian researchers and network leaders, who are highly familiar with the Brazilian research system, is a direct and high quality source of information. Joint interest projects are proposed by hosted Brazilian researchers.These projects were found to be excellent contributions as these scientists are aware of the strengths and weaknesses of the stakeholders in both countries. The established collaborations are ongoing and even being diversified. The Labex Program is thus an instrument for the strengthening and diversification of established partnerships but especially an opening towards collaborations with excellence research teams. One of the tangible results is the creation of the International Advanced Biology Consortium (CIBA), which pools Brazilian and French partners for the purpose of improving plants of interest for tropical and Mediterranean agriculture. Labex is therefore also a complement to standard cooperation tools. Although virtual communication, with all of its advantages, is now omnipresent, joint work as part of a team within the same laboratory can bind links of a completely different type. Based on the work started by researchers of the Labex-Europe Program, EMBRAPA is now developing this strategic partnership model not only in France but also in other European countries, especially England (Rothamsted Research Station) and Germany (Julich Institute). A Labex researcher was hosted in the Netherlands (Wageningen University) for 4 years and other host countries are targeted in the future. As EMBRAPA’s Labex Program has been efficient in one direction, it could also operate well in the other–this is the aim of the ‘Inverse Labex’ project, tested by foreign senior researchers in EMBRAPA research centers in Brazil. 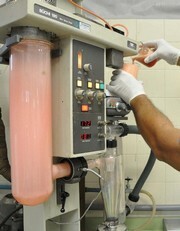 In addition to the many IRD and CIRAD researchers posted in various EMBRAPA centers in Brazil, a Korean RDA researcher, two ARS/USDA researchers and an English researcher from the Rothamsted Research Station, associated with the Biotechnology and Biological Sciences Research Council, have been hosted in different laboratories. Soon, a German researcher from Julich Institute may come to an EMBRAPA research centre as well. 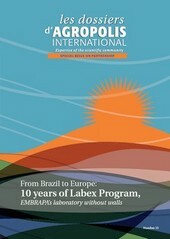 The Brazilian Labex model has also inspired other countries: in March 2012, Agropolis International signed a partnership agreement with INTA (Instituto Nacional de Tecnología Agropecuaria) in Buenos Aires to host the first LabIntex offices in Montpellier, which is based on EMBRAPA’s Labex Program. Strategies for high-throughput studies of genomes and their expression, combined with functional genomics approaches, enable the characterization of plant genetic resources. Using cutting-edge technologies and conventional breeding approaches, this knowledge facilitates breeding of new varieties with the aim of reducing the impact of stress on crop productivity and improving the nutritional safety and quality of produce. No single research institution is, however, capable of mobilizing the expertise required to use them in varietal breeding programs while making effective use of the available biological resource diversity. 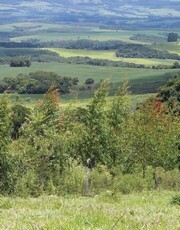 This observation prompted EMBRAPA and Agropolis International, with the support of CIRAD, to found CIBA in 2008. CIBA involves Brazilian and French partners (see below) and their scientific networks, who pool their resources, capacities, knowledge and expertise to develop and use these innovative advanced biology and genetic improvement tools to conduct research on tropical species of agricultural interest. CIBA has a portfolio of some thirty collaboration projects and also serves as a place for exchange, training and a forum for discussions that will give rise to the development of new bilateral research projects. CIBA also promotes exchanges of French and Brazilian researchers, which has led to the submission and acce tance of research projects, especially by CIRAD, EMBRAPA and Agropolis Fondation. In the future, CIBA will be further strengthened by joint self-funding arrangements for research projects that are strategic for its partners. Agropolis International signed a technical partnership agreement with the Instituto Nacional de Tecnología Agropecuaria (INTA) in late March 2012 at Buenos Aires (Argentina) to set up its first LabIntex (Virtual Laboratories of INTA Abroad) in Montpellier (France)–it is modeled on EMBRAPA’s Brazilian Labex and is supported by the Inter-American Development Bank (IDB). According to Carlos Casamiquela, President of the INTA : The strategic presence of EMBRAPA’s Labex-Europe and INTA’s LabIntex in France will enable Brazil and Argentina to be involved in top-notch research by cooperating with their European partners. Agropolis International, as a cooperation platform, facilitates interactions between these two laboratories with stakeholders of the European scientific community. EMBRAPA, since its inception, has been acting in close collaboration with different international institutions. It also created a Secretary for International Affairs (SIA) in 2009, which is directly linked to the cabinet for the Director-President as a result of the increased worldwide demand for agricultural technologies and partnership proposals. The Secretary for International Affairs (SIA) set up three coordination areas: scientific, technological businesses and structuring projects. The aim of scientific coordination, or knowledge interchange coordination, is to enhance scientific partnerships while consolidating EMBRAPA’s image as a top quality agricultural research and innovation corporation. This coordination encompasses the entire Labex Program (USA, Europe, South Korea, China) and bilateral agreements with other agricultural research institutes, universities and private companies. It also encompasses multilateral agreements with the CGIAR Consortium (Global Agricultural Research Partnership), participants in PROCISUR (Cooperative Program for Agrifood and Agroindustrial Technological Development of the Southern Cone of the Instituto Interamericano de Cooperación para la Agricultura) and other mechanisms involving several countries. The Labex Program addresses the need for institutional tools to enhance international cooperation, and to create means to tighten strategic relationships with influential agricultural R&D institutions in countries most concerned by this theme. 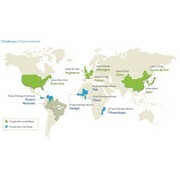 The technological business coordination team created technology transfer offices in Africa and South and Central America. These mechanisms play important roles in positioning EMBRAPA as a public corporation able to discuss and provide technological solutions to major challenges in areas such as sustainable agricultural production, global food security and climate change. The structuring project coordination team seeks funding opportunities from governments, institutions and international organizations in order to promote initiatives, programs and projects of interest for EMBRAPA and to manage project implementation in partnership with international funding agencies. 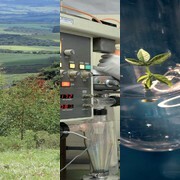 Since 2012, EMBRAPA’s new status facilitates these activities and strengthens its international strategy by increasing the flexibility of SIA in scientific and technological business (patents, licenses) fields, and with respect to technical cooperation activities managed by the Cooperation Agency of the Brazilian Ministry of Foreign Affairs. On the occasion of the arrival of the new coordinator of Labex-Europe in Montpellier, President Director General of Embrapa (Empresa Brasileira de Pesquisa Agropecuária, Brazil) Mauricio A. Lopes, will come to France from 11th to 13th March, 2013. 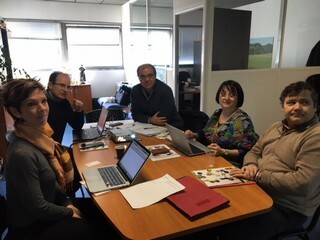 A series of meetings are scheduled, first in Paris and then in Montpellier with different institutions (Cirad, Inra, Montpellier SupAgro, Agreenium, IRD, CNRS, Irstea, UM2, CGIAR Consortium, Ministry of agriculture-DGER, Agropolis International) leading to the signing or renewing of several cooperation agreements. Claudio REIS DE CARVALHO succeeded Pedro BRAGA ARCURI as the new coordinator of Labex Europe" (Embrapa's external laboratory). He held this office from March 2012 to the end of 2015 at the Headquarters of LABEX-Europe located at Agropolis International since 2002.